This farm cake was supposed to be a simple 2 tier cake with a farm scene. It was for a 1st birthday party for a little boy. His mom really wanted the barn on top but a cake that size was out of the budget. I said I would find some little farm animals and toy barn and do the cake smaller and more to fit the budget. Well, I found the animals online but every barn I found just wasn’t right. It was either to big or to small or just didn’t look right for the cake. So, at the last minute, I decided to just carve the barn out of cake and make it the big 3 tier cake that mommy was really wanting and just not worry about the price. Needless to say, she was so surprised and absolutely loved it! I made the bottom tier out of 2 10 inch white cakes and crumb coated them and then applied the final coat of butter cream icing and free handed all the decorations and the middle tier is 2 8 inch white cakes, iced and decorated the same way and then I made 2 6 inch cakes and crumb coated them and then cut the very top in slants on both sides to resemble the slant of a roof top. I then covered all 4 sides in red butter cream icing and drew on the door of the barn and applied black butter cream icing (chocolate butter cream icing tinted black) to the top to make the roof of the barn. 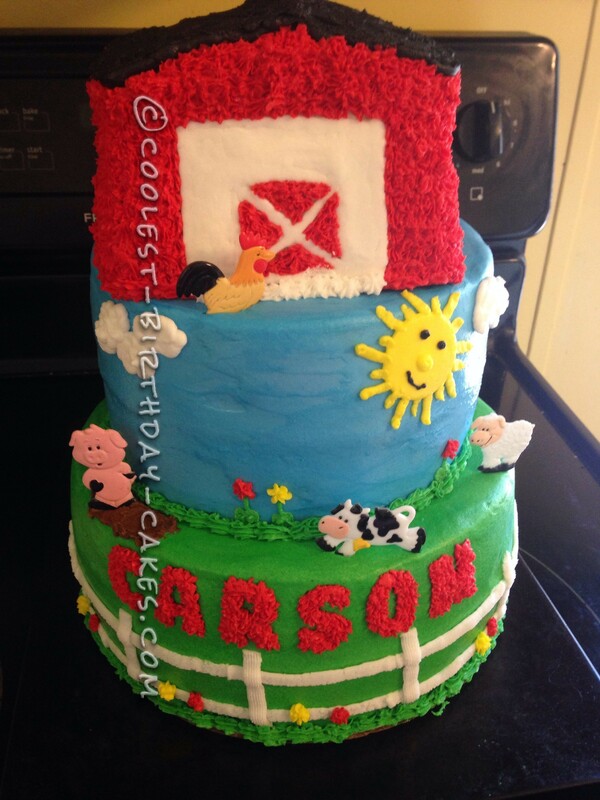 I placed the little farm animals around the cake and even fixed a mud hole for the pig. I think it turned out good! I really enjoyed making this cake. The only hard part was figuring out how to move it from place to place because it was extremely heavy! Everyone really loved the cake and said it tasted great! Birthday cake idea posted by Christy P.